Let your pup join in on the sweet tooth fun with this handmade donut squeaky toy. The day your pooch turns down a donut is the day he finally stands up to the vacuum. Let him join in on the sweet tooth fun with this handmade squeaky toy. 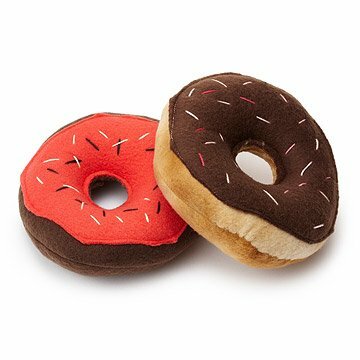 Made from cuddly fleece, each donut duo is decorated with "frosting" drizzles and sweet embroidered sprinkles, perfect for showing your four-legged friend you care. Handmade by Trish Iriye in Vallejo, California. See above; I bought these because I consider then "soft sculpture." No dog will ever play with them! Cute but already falling apart after one week. Our dog does not chew on them so disappointing that they are already falling apart at the seams. He enjoys tossing them into the air and catching them. This item ripped easily. Horrible gift. Purchased these for two friends; one has a larger dog and one just got a new puppy. Both dogs endorse the toys! Purchased this for my labrador retriever. The quality is fantastic, really well made. I can tell that these will last a while. Really liked that they were handmade and not mass produced. Perfect for my dog! My dog destroys all stuffed pet toys in 5 minutes. These were a present for her at Christmas 2 months ago and they are still in one piece.